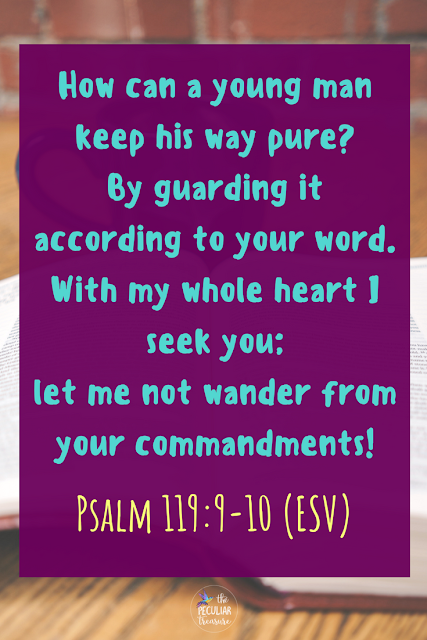 The Bible tells us to seek God constantly (Joshua 1:8), and for us to love His Word and hide it in our hearts (Psalm 119:9-16). But Christians often put off reading the Bible. Some even avoid it completely. But why is that? Why do Christians stop reading the Bible? 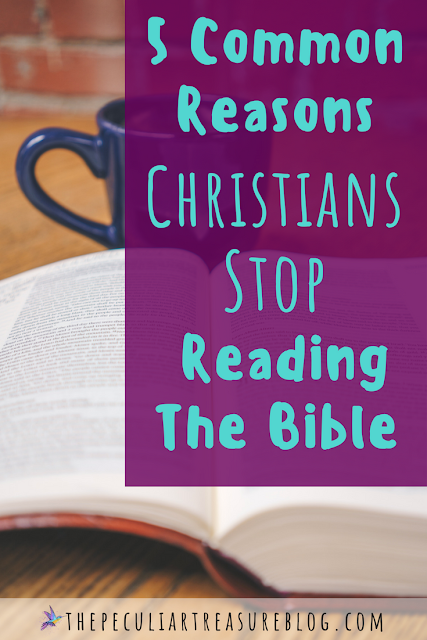 Here are 5 common reasons that Christians stop reading the Bible. Whether you grew up in a Christian home or not, and whether you came to Christ as an adult or as a kid, it is likely that at some point or another, you have struggled with reading the Bible consistently. Maybe you are in that place right now, and you aren't sure why you landed there. Maybe you just got out of that rut, or maybe you haven't found yourself there yet. And I hope you never find yourself there. But it seems that most Christians slip into this habit at some point in life. It isn't just by chance that this happens. There are reasons that this is such a common occurrence for Christians, but that doesn't make it right. In all actuality, the fact that this is so ordinary in the Christian life makes me think that it's more of a curable sickness that we just accept instead of trying to find a cure. And though we will never eliminate this problem fully, I do think that if we can identify the "why" behind what's happening, we may be able to stop some of the problem in it's tracks. 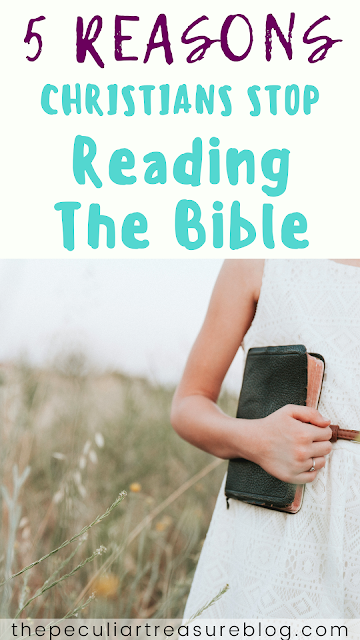 So today, I am addressing 5 common reasons that Christians stop reading their Bibles, in hopes that by recognizing the cause, we can fight against it and overcome this issue. The Bible can be really confusing. I readily admit that. And when we sit down to spend time with God and end up feeling confused by the end, it can be incredibly frustrating. I totally get it. It happens to me too. And I feel like this is one of the most common reasons that people stop reading the Bible. But God gave us the Bible as a gift. 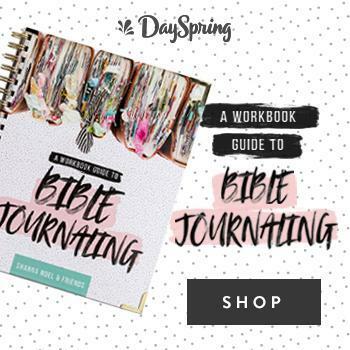 He inspired the writer's of the Bible to record His truths so that we would have them readily available to us, and so that we could know Him better. He is not trying to confuse us or frustrate us. Everything the Bible teaches can be understood. This doesn't mean that we will know everything, or that God expects us to know everything. It isn't a test. He doesn't expect us to know everything, but he does expect our pursuit of Him (Deut. 4:29). God has given us the Holy Spirit to help us understand His truths, but that doesn't mean that He reveals everything about His word right off the bat. And it does not mean that whatever we think and feel about a passage of scripture is automatically true just because we have the Holy Spirit. Many cults have been formed through well-meaning people assuming that what they think and feel is true simply because they think and feel it. 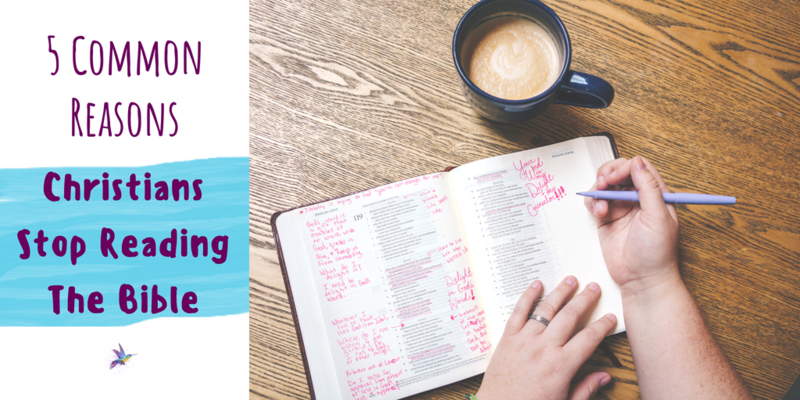 But through prayer, through the Holy Spirit's guidance, through reading commentaries from solid church fathers, and finding solid bible studies to take part in, we can begin to understand scripture more clearly. We can seek and know God accurately. But we have to actually read His word to do so. 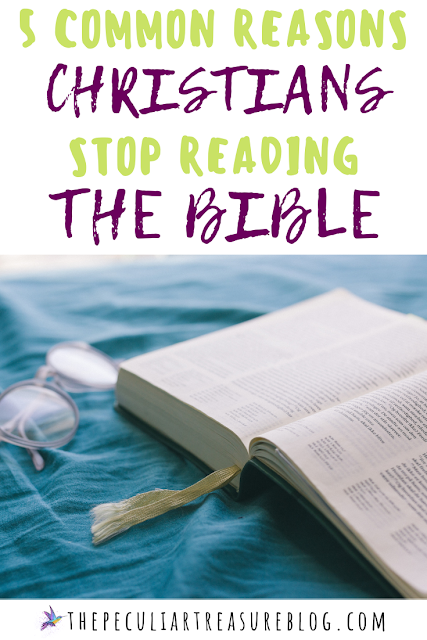 If a Christian is living a life of sin, it is fairly common that they will stop reading their Bible. They don't want to be convicted of their sinful habits, and they don't want to change their lifestyle, so they avoid the source that would shine light on their dark ways. If you find yourself here, you are in danger of desensitizing yourself to God's leading. 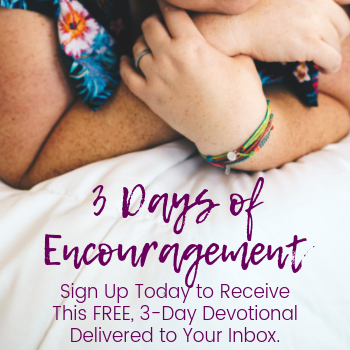 I would encourage you to ask God to help you be repentant and to want what He wants. I would encourage you to ask His forgiveness, and then start seeking Him in His word and in prayer again. Guard your heart and life from sin (Romans 12:2). I don't know about you, but there have been many times in my life when I was mad at God. During these times, I really didn't want to read the Bible. 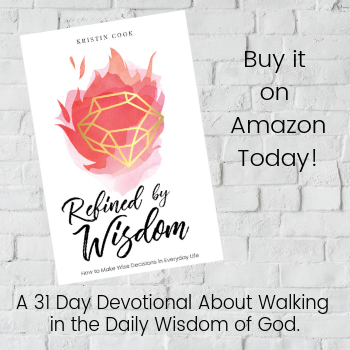 I wanted to be away from God because I was angry that things weren't working out the way I wanted them to, or because I didn't feel like God was doing what He "should" be doing. First of all, God doesn't owe me (or you) anything. He has already sacrificed His son for us. That should be enough. Secondly, staying away from God is like purposefully poisoning ourselves: the more we do it, the worse it gets, and it eventually destroys us. God is good. If we think He isn't, it's us who needs to change, not Him. Seek Him, even in your anger. He can handle it. Though the statement "ignorance is bliss" is often misleading and untrue, many of us still feel it's pull. Some things that we can find in the Bible are hard to swallow and we don't always like what it has to say. In a culture that proclaims that all ideas are valid and true- that our experiences and feelings are king- it's hard to reconcile the Bible calling us to deny ourselves, to give up sinful ways (ways that we don't even like acknowledging as sin in the first place), and to put what the word of God says first. This can be so hard because the world hates what the Bible says. Some Christians even hate parts of the Bible and they ignore it, change it, and pretend the hard stuff is man-made. But the truth of the matter is, valuing the ease of our minds more than we value knowing God and obeying His command to seek him in his word is idolatry. 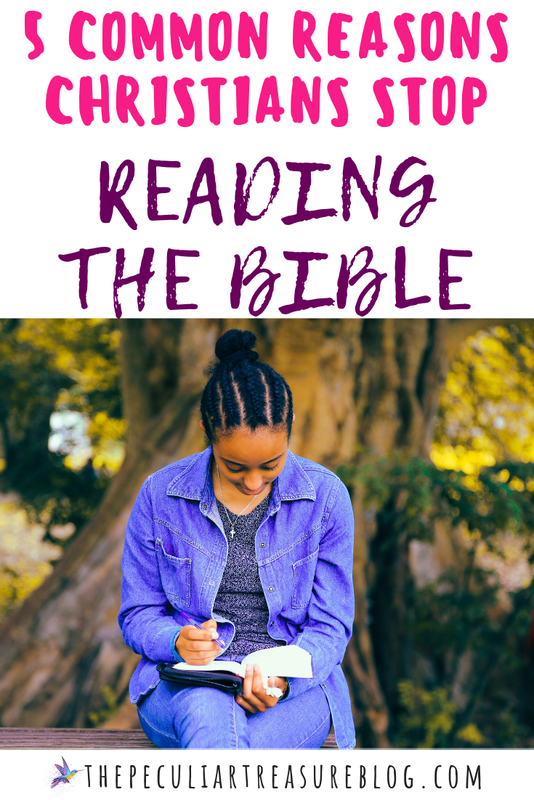 Therefore, when we don't read the Bible so that we can avoid the hard parts, we are idolizing our own comfort and saying that that is more important than spending time with God, learning more about Him, and growing in Him. We can't grow in a relationship with someone we don't know or with someone who we aren't learning more about. God says that He breathed the whole Bible to us (2 Tim. 3:16-17). The Bible was given to us by God. That means that the Bible is how we learn more about Him. Avoiding the Bible because we are scared there is something in it's pages that we won't like is a dangerous, sinful, and badly-ending game to play. Trust God to help you understand the hard things in the Bible that you don't particularly like. He can handle your questions and concerns. He can show you truth even when you don't like the hard stuff. But you have to open the Bible and read it first. I've admitted to laziness in an umpti-gazillion blog posts, and that laziness does not stop short of my Bible reading. Though I have been guilty of all five of the reasons in this post at different times in my life, laziness is my most common and persistent problem. I choose Netflix, coffee, Candy Crush, naps, video games, blogging, scrolling through Instagram, and a ton of other things over the Bible all the time. Why? Because they are easier. Because I don't have to think too hard. Because I can stay in the "unicorns and rainbows" portion of my brain more easily. But I also acknowledge that laziness is a backwards thing when it comes to Bible reading. God is supposed to be our rest. We are made to rest in God, and find comfort in Him. Is it a rainbows and unicorns kind of rest? No. And do we have to put effort and care into our relationship with God? Yes. But God's rest is what will ultimately satisfy us if we will just embrace it and live in it, instead of trying to stay in some half-version of "rest" through our own laziness. Peculiar treasures, if you made it to the end of this post, thank you! I am so glad you are here. I know this was longer than my typical post, but the words just kept coming, and I decided to share them. You are loved and valued. Now go live life as the peculiar treasures you were created to be.